In a bid to create the world’s largest firm by lawyer headcount, Dentons is to combine with China’s biggest firm, Dacheng Law Offices, to form a 6,600-lawyer giant operating under a Swiss verein structure. With offices across over 50 countries, combined revenues will be in the region of $1.7bn. At the end of the financial year 2013/14, Dentons’ turnover was $1.3bn, while Dacheng confirmed that its revenues currently stand at $400m, although revenues were reported to have hit just RMB1.78bn ($287m) in the 2013 financial year. The firm will have revenue per lawyer of $257,000, compared to $769,000 across the Global 100. Both partnerships confirmed the tie-up in late January, although at the time of press, both firms were awaiting approval from Chinese regulators. DLA Piper, Milbank, Tweed, Hadley & McCloy and Sidley Austin have all completed partner raids on rivals in Asia as they seek to expand their presence in the region. Dentons is set to create the biggest law firm in the world by lawyer headcount through a combination with leading Chinese firm Dacheng, a move that will establish a 6,600-lawyer giant operating under a Swiss verein structure. Patrick Zheng, Clyde & Co: With a growing number of arbitral institutions around the world, why should a party use the China International Economic and Trade Arbitration Commission (CIETAC)? Yu Jianlong, CIETAC: Founded in 1956, CIETAC is the oldest international arbitration institution in China. With more than half a century’s development, it is also among the busiest arbitral centres in the world. We recommend that a party uses CIETAC arbitration due to the fact that it offers a number of advantages. Firstly, the CIETAC rules are similar to those of all the major arbitration institutions, thereby offering parties the most autonomy possible. In addition, we have over 300 foreign arbitrators from more than 40 jurisdictions; in international or foreign-related cases, parties may agree on the nationality of the arbitrators. Secondly, CIETAC is independent of any government agencies in China, and CIETAC arbitrators do not represent any parties. Thirdly, most CIETAC cases are concluded within six months after the tribunal is constituted, meaning that our arbitration fees are relatively low compared to other major international arbitration institutions. Finally, CIETAC offers the unique combination of arbitration with mediation – a combination which not only resolves disputes, but also renews positive business and personal relations between parties. Ambrose Lam, president of the Hong Kong Law Society since May last year, was forced to resign on 19 August after a vote of no confidence was issued in response to his recent support of a Beijing white paper that raised issues over Hong Kong’s judicial independence. Hong Kong lawyers turned out in force on 14 August to an extraordinary general meeting (EGM), where 2,392 lawyers cast a vote of no confidence in the president. Just 1,478 lawyers voted against the motion, despite law firms reporting pressure from clients on the mainland not to pass the motion. Clyde & Co’s ambitious Greater China strategy has been credited with the trophy hire this week of Clifford Chance’s (CC’s) co-head of China litigation and arbitration Patrick Zheng to head its Beijing office, as in the Middle East Eversheds’ regional chairman Christopher Jobson joined as a partner in Abu Dhabi. The lateral hire market has been particularly active in Asia this week, with some of the most established international players in the region losing experienced partners. 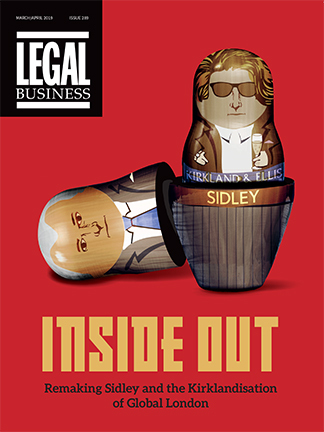 With the European Union in its spiralling debt mess and the US hugely overdrawn, global businesses are concentrating their efforts on Asia and, naturally, law firms are following. But whereas Hong Kong was traditionally the default outpost for international law firms, Singapore has emerged as the destination of choice for many newcomers. There are two main reasons for this. Firstly, the city state is ideally positioned to serve both India and China, two major economic powerhouses that form the so-called ‘Chindia’ market. Secondly, the shackles that restricted foreign firms operating in Singapore have been loosened.